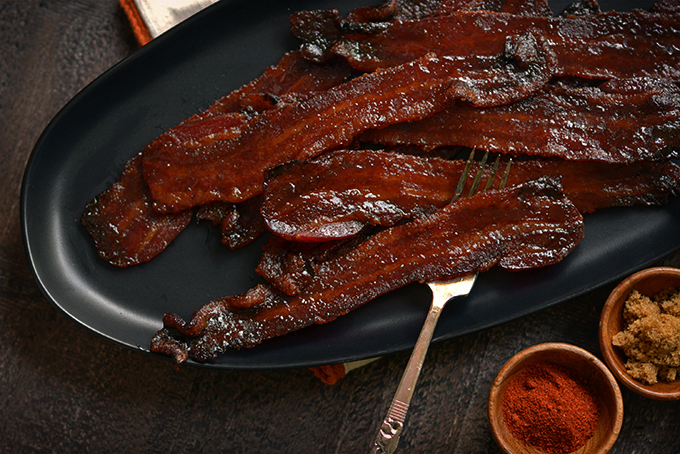 Chipotle Brown Sugar Candied Bacon – Sugar and spice and everything nice; that’s what this dangerously addictive dish is made of! For Father’s Day and Mother’s Day my husband and I plan a special meal for each other every year. The meal is “from the kids” of course, but I don’t think anyone wants the kids making anything more involved than cereal. The cereal is even a risk. It would likely result in a gallon of milk being dumped all over the kitchen floor. Minimally we’re looking at my 7-year-old leaving a trail of cereal pieces from the kitchen counter to the living room couch. My 1 1/2-year-old would then stomp on every little piece just for the fun of it. The joys of parenting! And thus the need to eat our stress away with yummy Mother’s Day and Father’s Day meals… not made by the kids! When Father’s Day comes around my husband always picks something meaty for me too cook for him. It would be kind of nice if he wanted to go out to eat (so that someone else could cook and clean up the meal). I suppose the fact that he prefers to stay in for the day is a compliment to my cooking and I’ll take that. Plus that bodes well for a food blogger! 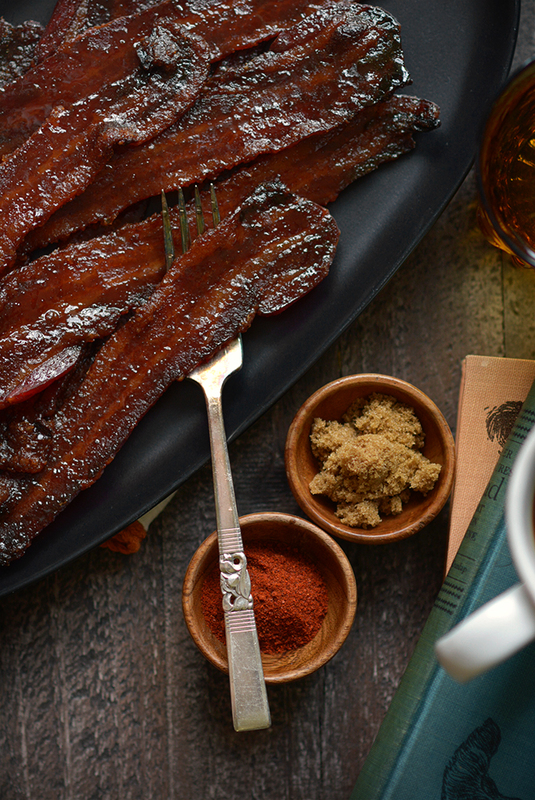 In addition to a meat-based dinner extravaganza on the grill this year, I decided to make an extra special Father’s Day treat for breakfast – candied bacon! If you’ve never tasted candied bacon before you probably shouldn’t, because this stuff is like the crack of the food world. You’ll want to keep eating it until it makes you sick. Once you’ve realized that you’ve eaten through an entire package of bacon in a day you’ll feel compelled to make more. It’s a vicious cycle of eating bacon. This is all because you take the bacon-ness of the bacon and coat it in sweet, caramelized brown sugar. Bacon is pretty much the best flavor known to humankind (someone could argue for chocolate), and it also seems like none of us can get enough of sweet things. I took the recipe a step further and turned it into Chipotle Brown Sugar Candied Bacon. 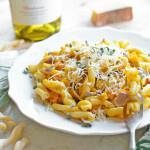 I love spicy food and I can’t even begin to describe how tempting the triad of bacon-ness, sugar, and heat is! It’s everything the Father in your life is going to go crazy for this Father’s Day. Don’t give him a bouquet of flowers or a tie, give him what he really wants. A bouquet of candied bacon. 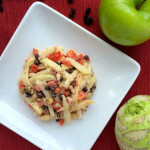 Sugar and spice and everything nice; that's what this dangerously addictive dish is made of! In a small bowl evenly mix together the dark brown sugar and chipotle chili powder. ¾ teaspoon chipotle chili powder produces a mild heat and 1 to 1¼ teaspoons produces a medium heat. If you really love spicy food you could add more, but be careful! 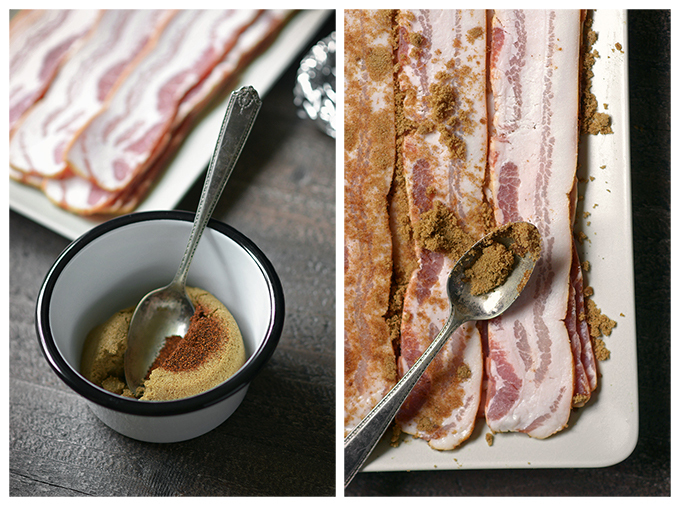 On a large plate rub the brown sugar mixture onto both sides of each slice of bacon. The brown sugar should coat the bacon, but it shouldn’t be caked on. 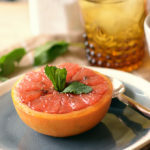 If you over-apply the sugar it will drip and burn when you cook it. Line a baking sheet with aluminum foil to make clean-up easier later. Place an oven safe baking rack on the lined baking sheet. Next, evenly arrange the bacon on the baking rack so that it’s touching, but not overlapping. Bake in a 350ºF oven for 40-45 minutes. Do not flip the bacon. The bacon is done once it starts to appear crispy. Different people like their bacon cooked to different levels of doneness so adjust the cooking time to appeal to your particular preference. Once cooked, allow the bacon to cool for 5 minutes and then place it on a plate or a piece of wax paper so that it can cool without sticking to the baking rack. Take care not to burn yourself on the hot sugar. Do not place the bacon onto paper towels as the candied brown sugar will stick to it. Enjoy after the bacon has cooled for 5 more minutes or serve at room temperature. 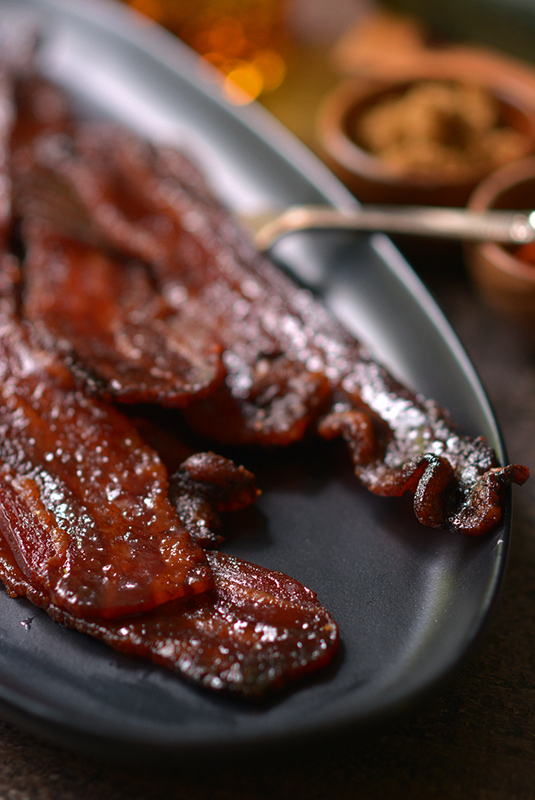 *Many candied bacon recipes call for baking the bacon at a temperature of 400ºF. I tested this recipe twice each at 400ºF and 350ºF and found that cooking the bacon more slowly at a lower temperature resulted in the sugar caramelizing better with less burning. I have a serious bacon addiction. Actually my whole family has it. 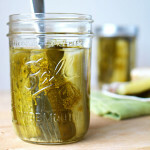 I think I made a batch almost everyday. I have never candied bacon though so you have really blown my mind with this possibility. Love the spices you used too! As much as I love most anything salty + sweet, I’ve never had candied bacon, mostly because of the reasons you mentioned above. I just don’t think I could stop eating it once I got started. Your addition of chopotle has me more tempted than ever, though. Yum! 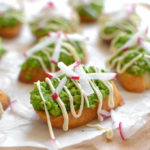 Oh my goodness – this post was such a delight to read! I adored your description of the high-stakes game that is “the kids attempt to make breakfast”! Hilarious! And your intro description (“Sugar and spice …”) is 100% spot-on perfect – one of the best I’ve read! Plus the gorgeous pics and all that sweet-spicy-baconyness … fantastic! OOOOOOOH MYYYY! That has got to be the tastiest looking bacon I ever laid my little eyeballs on! I can think of so many uses for this, especially a burger. Though, eating as it would be pretty awesome too 😉 Pinned! Thick sliced bacon is such a game changer! I love the salty-sweet-spicy treatment you’ve given this. 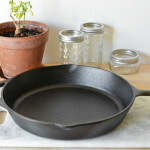 It would be perfect for brunch alongside pretty much ANYTHING! Yum! 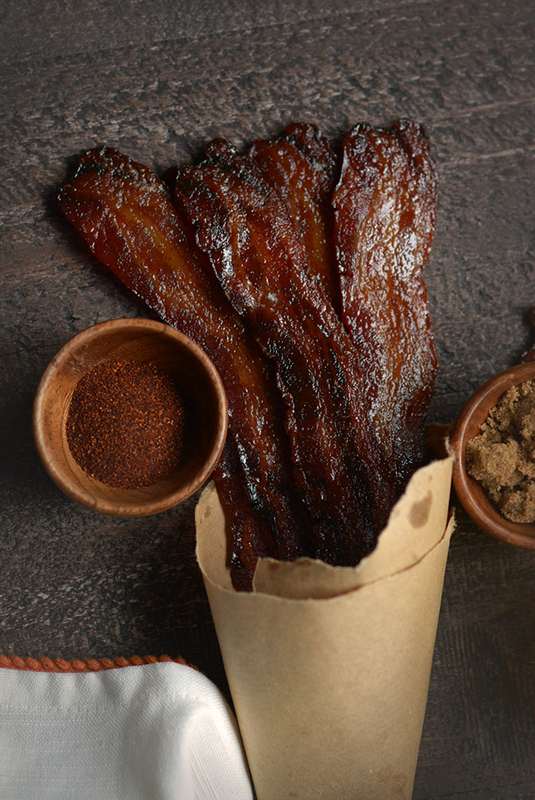 Just when you thought bacon could not get any better….this recipe appears. OMG…I can just imagine how good this tastes. The aroma while it cooks would be INSANE!! I freaking love candied bacon. It’s my go-to when I need to bring a snack to a party! 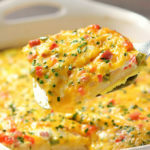 This would be a hit for Father’s Day breakfast. Sweet and spicy paired with bacon makes a very unique dish. OMIGOSH, I’m loving EVERYTHING about this bacon. 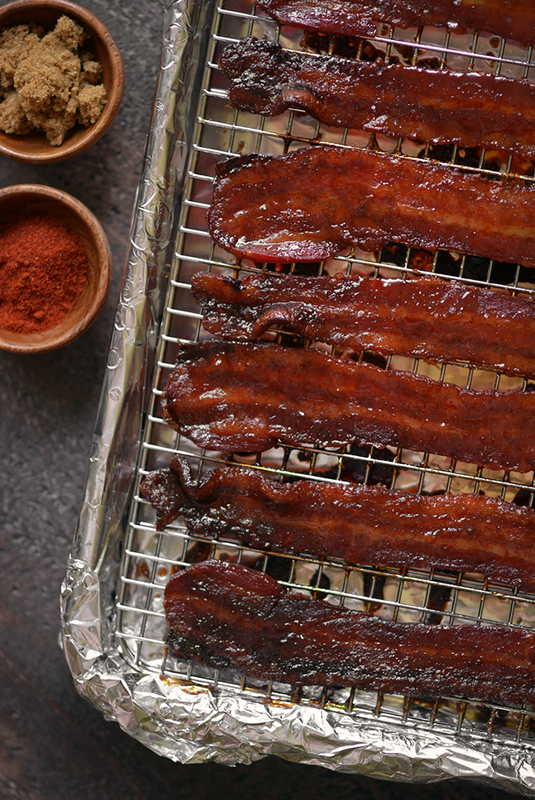 You had me at bacon, but then you added the brown sugar and chipotle chili powder. Outstanding! It is a nice compliment that he prefers your cooking to going out 🙂 . 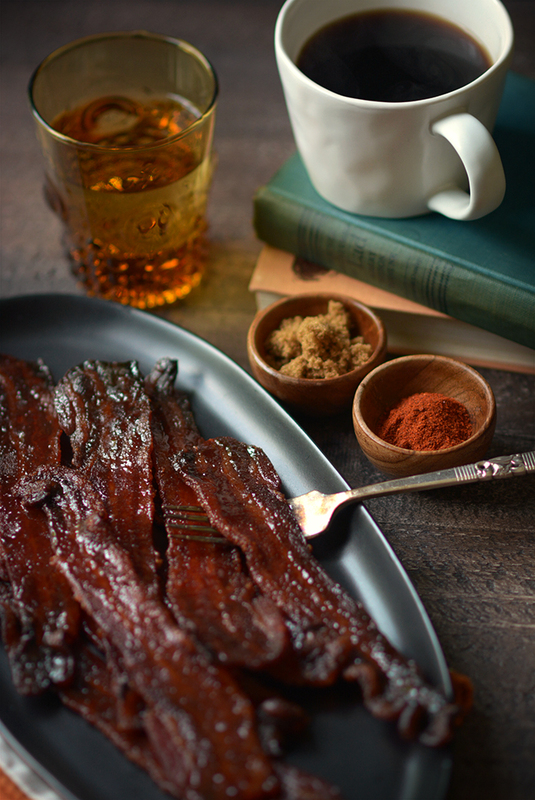 My husband would have loved spicy candied bacon this morning for Father’s day! 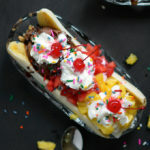 This looks dangerously good. Bacon is a food third-dimension. Excuse me while I dream of bacon until I next consume it. Your photos made me very very hungry. 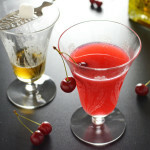 I am keeping this recipe to use it next weekend. mmmm, bacon!